Neymar, Messi, Ronaldo: Is Brazilian now world's best player? For the past few years, there has been a general consensus of opinion among football supporters that Lionel Messi and Cristiano Ronaldo are the best players in the world. You might argue about the order in which they should be placed, but few fans - aside from some Barcelona or Real Madrid followers who are unwilling to praise their greatest enemy's biggest star - would question the suggestion that those two are head and shoulders above everybody else. That impression is supported by the result of the annual Ballon d'Or award, which has been presented to Messi in 2009, 2010, 2011 and 2012 and to Ronaldo in 2008, 2013 and 2014, with nobody else claiming the prize since Kaka in 2007. Now, however, perhaps it is time to reconsider the old notion that nobody else comes close to touching Messi and Ronaldo, because another flamboyant talent is also performing at similarly outrageous levels: Neymar. And this weekend he could have no bigger stage to prove it, as Barcelona travel to Real Madrid for the first Clasico of the season. Late on in Barcelona's home game with Villarreal this month, with the hosts leading 2-0 through goals from Neymar and Luis Suarez, a familiar chant echoed around the Nou Camp as fans reminded an injured hero that he had not been forgotten: "Meeessi, Meeessi, Meeessi…"
While they sang, Barca surged forward and Luis Suarez advanced down the left before curling a bouncing cross towards Neymar on the edge of the penalty area. What Neymar did next will never be forgotten by those fortunate enough to witness it, with the Brazilian forward conjuring a piece of magic which his national team coach Dunga later described as "the sort of thing that makes football the beautiful game". With his back to goal, Neymar controlled the cross with his stomach, then immediately flicked it over his head to lose his marker and swivelled 180 degrees to meet the dropping ball with a fierce low volley which flew into the back of the net. The goal was met with astonishment as much as jubilation, and more than 70,000 fans rose to their feet to acclaim the scorer by quickly adapting their previous chant: "Neeeymar, Neeeymar, Neeeymar." That goal against Villarreal was Neymar's 11th of the season in La Liga, making him the league's top scorer - three ahead of Ronaldo despite playing 93 fewer minutes. Not insignificantly, he has been in a particularly rich vein of form during Messi's spell on the sidelines, rising to the challenge of compensating for his fellow South American's absence by scoring 10 goals in his past seven club games. Although this season's achievements have been particularly impressive, nobody should be too surprised to see Neymar making such a big impact because he has been scoring goals for fun ever since breaking into the Santos first team at the age of 17. He is still only 23, yet Neymar has 249 career goals: 136 for Santos, 67 for Barcelona and 46 for Brazil. To put those figures into context, by the time Messi and Ronaldo reached the age Neymar is now (23 years and nine months), they had 'only' registered respective career goal tallies of 186 and 127. Each case is different, with Ronaldo needing some time to develop into the awesome physical specimen he is today, while Messi's younger years were spent in a Barcelona team containing other established stars who commanded more than their fair share of attention. Furthermore, you could argue that a chunk of Neymar's early goals came 'cheaply' as they were scored in the relatively low standard Brazilian state championship. While it does not necessarily follow that Neymar will end up scoring more goals than Messi and Ronaldo simply because he has scored more than them by his current age, surely it suggests that this young man from Sao Paulo should be taken seriously as a potential all-time great? Neymar's electrifying performances over the past few weeks have attracted considerable attention in Spain and Albert Masnou, the deputy editor of Barcelona-based newspaper Sport, believes he is playing better than Ronaldo. "At the moment he is surpassing Ronaldo," Masnou told BBC Sport. "Cristiano is enduring a 'grey' period, uncomfortable with his club and his coach. He isn't leading his team or serving as their reference point, although that could easily change in just one game. 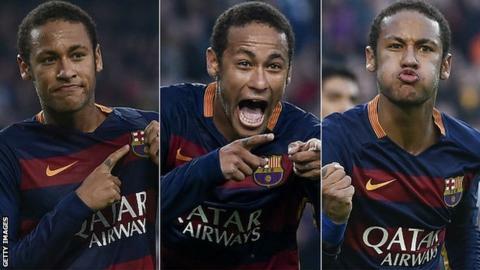 "But Neymar has become more integral to Barca. He is more consistent and growing a lot as the years go by. Now he is capable of leading the team when Messi's not there, and we are seeing his full potential." Those views were echoed by a man who knows Neymar extremely well: Tata Martino, who was his coach at Barcelona when he arrived from Santos in the summer of 2013 and who is now in charge of Argentina. Before last week's World Cup qualifier between the two nations, Martino commented: "Neymar has reached a point of maturity. What he's doing now puts him on a level with the two footballers we consider above the rest." Ronaldinho, who remains a revered figure among Barcelona fans, was also glowing in his tribute of his countryman as he enthused: "Neymar is a phenomenon. It's nice to see a Brazilian continuing to make history and I think he can be the greatest in the world." It will soon get much harder for Neymar to maintain his recent standards, however, because Messi's absence through injury is nearly over. And when that happens, the focus of the Barca team and everyone else - fans, media and opponents - will immediately return to the Argentine. Messi is, quite simply, the man around whom the Catalans have built their team, and when he is on the pitch the primary function of the other 10 players is to service him. Messi's status is illustrated off the pitch by the parrot-like phrase trotted out weekly by every Barca player that he is "the best player in the world", and manager Luis Enrique notably brushed aside a question after the Villarreal game asking whether Neymar is the second best, instead blandly asserting that he is proud to coach lots of great players. Considering Messi's consistent greatness, the reliance upon him is understandable. But it does mean the other players are forced to somewhat subdue their natural games in order to meet the demands of contributing to a team built around Messi. Some, such as Zlatan Ibrahimovic and Alexis Sanchez, have been forced to leave in order to allow their personal talents to flourish. Others - and there is perhaps no better example than Neymar - have accepted that role and made the most out of playing for Messi first, the team second and themselves third. Masnou says Neymar will, in the short term, have no problem stepping out of the spotlight once Messi returns. "He didn't join Barca to overshadow Messi, but to be his heir," Masnou said. "Neymar has been the king for two months but he knows that when Messi is there, the leader is Messi." Neymar is widely regarded in Barcelona as the heir apparent: the player lined up to become the team's focal point when Messi has retired or entered into decline. The question, however, is how much longer Neymar will be prepared to accept that role. Messi is only 28 and could still be performing at or near his peak for another four or five years. By then, Neymar will be in his late 20s and may well have grown tired of being the chief member of the supporting cast rather than taking the lead role. Perhaps the key for Barca will be to create a slightly more level playing field, one which places just as much importance in Neymar as it does in Messi: to use Masnou's poetic phrase, a system which makes them "equal protagonists". The past few weeks have suggested that Neymar is good enough to merit a more elevated standing, placing him shoulder to shoulder with Messi rather than deferentially looking up to him. Whether Messi will be prepared to share his crown is another matter.